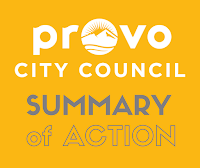 A motion to continue the discussion on Miss Provo funding to the June 19, 2018 Work Meeting was approved 6:0, with George Handley excused. Presentation only. This item was already scheduled for the June 5, 2018 Council Meeting. 3. A discussion on rental dwelling license fees (18-065) Presentation only. A motion to schedule this item for the June 19, 2018 Council Meeting was approved 6:0, with George Handley excused. 5. A discussion with officials from Utah League of Cities and Towns regarding State legislative items (18-067) Presentation only. Presentation only. Council would like staff to work with engineering to get information on the Bulldog Blvd. project out to the public. Staff will also coordinate with Leadership to schedule another discussion about Bulldog Blvd. Presentation only. If Council members want to fund anything that is not in the budget yet, they will come to staff with a proposal (supported by four Council members) on what to cut from the budget in order to make money available for their item of interest. This item was already scheduled for the June 5, 2018 Council Meeting. The related presentation was continued until the evening meeting due to a time shortage. Approved by unanimous consent, with George Handley excused. 1. A resolution approving the Program Year 2018 Annual Action Plan, Fourth Year Update to the 2015 Five-Year Consolidated Plan, including CDBG and HOME Funding recommendations (18-056) Approved 6:0, with George Handley excused. Approved 6:0, with George Handley excused. 3. An ordinance amending the zone map classification of approximately 43 acres of real property, generally located from 920 S to East Bay Blvd and from University Ave to 190 E, from Planning Industrial Commercial (PIC) to Regional Shopping Center (SC3). East Bay Neighborhood. (PLRZ20180100) Approved 6:0, with George Handley excused. 4. An ordinance amending Provo City Code to make the definitions of “baching singles” and “family” consistent with state law. Citywide impact. (PLOTA20180054) Approved 6:0, with George Handley excused. 5. CONTINUED TO JUNE 19 COUNCIL MEETING: A resolution to adopt the amendments to the General Plan text for the General Plan update. 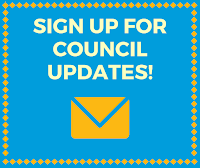 (PLGPA20180142) This item was already continued to the June 19, 2018 Council Meeting, at the request of Council Leadership. Public Hearing only; this item will be voted on at the June 19, 2019 Council Meeting. Corporation for the fiscal year beginning July 1, 2018 and ending June 30, 2019, in the amount of $7,377,462. (18-062) Public hearing only; this item will be voted on at the June 19, 2019 Council Meeting. 8. 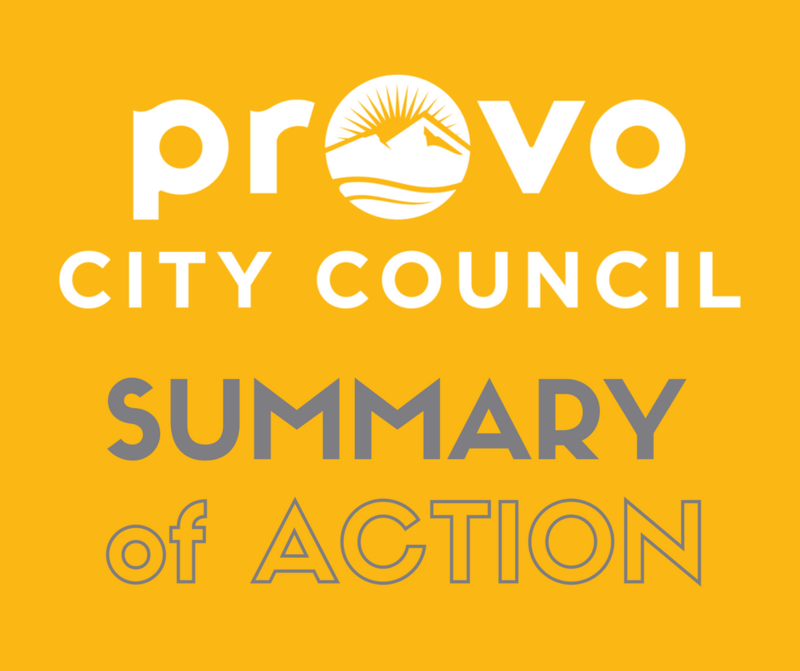 A public hearing on a resolution adopting a budget for the Provo City Stormwater Service District in the amount of $4,713,241 for the fiscal year beginning July 1, 2018 and ending June 30, 2019. (18-063) Public hearing only; this item will be voted on at the June 19, 2019 Council Meeting. Video recordings: Work Meeting (part 1), Work Meeting (part 2) and Council Meeting.